Click the button below to add the Multi purpose padded bag to your wish list. This zipped quilted bag has three side pockets (one with zip) as well as a large interior storage space. We love its super lightweight! Every square of this unique bag is handmade by a Hmong woman living in the hills of northern Thailand using the traditional reverse applique quilting method. Hmong women rely on their exquisite needlework to provide a living for their families. This bag is certified Fair Trade. CAMACRAFTS is a non-profit, self-help project which markets handicrafts from the Lao P.D.R. CAMACRAFTS strives to provide a sustainable method of income for village women that would otherwise be unavailable. CAMACRAFTS’ handicraft products are entirely handmade by Lao and Hmong village women who use traditional patterns and techniques. 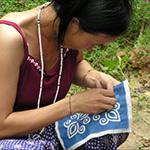 CAMACRAFTS strives to preserve the traditional needlework skills of Hmong and Lao women, such as Hmong appliqué, cross stitch, embroidery, and batik. CAMACRAFTS is a member of the World Fair Trade Organization.